Learn how to unplug, unwind, and find true happiness in your life.In today’s achievement-oriented society, it’s easy to find success and wealth but still be unhappy. We’re constantly working to achieve goals and make the people around us happy, and we’re foiled by what we see on social media. However, happiness is easy to find if you have the right tools. 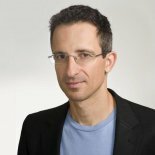 Tal Ben-Shahar, PhD, uses proven, evidence-based techniques to help people find happiness. He suggests unplugging from technology, forming real relationships -- whether romantic, professional or platonic -- and finding the overlap between what you’re good at and what makes you passionate. From there, we can give ourselves “permission to be human” and find peace. Join Dr. Taz as she and Dr. Ben-Shahar discuss how we can begin the journey to find happiness.